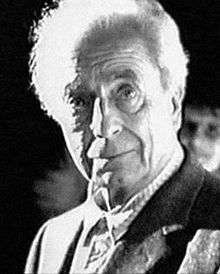 Michelangelo Antonioni, Cavaliere di Gran Croce OMRI (29 September 1912 – 30 July 2007), was an Italian film director, screenwriter, editor, and short story writer. Best known for his "trilogy on modernity and its discontents"—L'Avventura (1960), La Notte (1961), and L'Eclisse (1962)—Antonioni "redefined the concept of narrative cinema" and challenged traditional approaches to storytelling, realism, drama, and the world at large. He produced "enigmatic and intricate mood pieces" and rejected action in favor of contemplation, focusing on image and design over character and story. His films defined a "cinema of possibilities". While still a child, Antonioni was fond of drawing and music. A precocious violinist, he gave his first concert at the age of nine. Although he abandoned the violin with the discovery of cinema in his teens, drawing would remain a lifelong passion. "I have never drawn, even as a child, either puppets or silhouettes but rather facades of houses and gates. One of my favorite games consisted of organizing towns. Ignorant in architecture, I constructed buildings and streets crammed with little figures. I invented stories for them. These childhood happenings - I was eleven years old - were like little films." In 1940, Antonioni moved to Rome, where he worked for Cinema, the official Fascist film magazine edited by Vittorio Mussolini. However, Antonioni was fired a few months afterward. Later that year he enrolled at the Centro Sperimentale di Cinematografia to study film technique, but left it after three months. He was drafted into the army afterwards. During the war Antonioni survived being condemned to death for his membership in the resistance. In 1942, Antonioni co-wrote A Pilot Returns with Roberto Rossellini and worked as assistant director on Enrico Fulchignoni's I due Foscari. In 1943, he travelled to France to assist Marcel Carné on Les visiteurs du soir and then began a series of short films with Gente del Po (1943), a story of poor fishermen of the Po valley. After the Liberation, the film stock was stored in the East-Italian Fascist "Republic of Salò" and could not be recovered and edited until 1947 (the complete footage was never retrieved). These films were neorealist in style, being semi-documentary studies of the lives of ordinary people. In Le Amiche (1955), Antonioni experimented with a radical new style: instead of a conventional narrative, he presented a series of apparently disconnected events, and he used long takes as part of his film making style. Antonioni returned to their use in L'avventura (1960), which became his first international success. At the Cannes Film Festival it received a mixture of cheers and boos, but the film was popular in art house cinemas around the world. La notte (1961), starring Jeanne Moreau and Marcello Mastroianni, and L'Eclisse (1962), starring Alain Delon, followed L'avventura. These three films are commonly referred to as a trilogy because they are stylistically similar and all concerned with the alienation of man in the modern world. La notte won the Golden Bear award at the 11th Berlin International Film Festival, His first color film, Il deserto rosso (The Red Desert, 1964), deals with similar themes, and is sometimes considered the fourth film of the "trilogy". All of these films star Monica Vitti, his lover during that period. 1 2 Holden, Stephan (4 June 2006). "Antonioni's Nothingness and Beauty". The New York Times. Retrieved 21 May 2012. 1 2 Ankeny, Jason. "Michelangelo Antonioni". AllMovie. Retrieved 21 May 2012. ↑ "Michelangelo Antonioni, Director". Film Reference. Retrieved 9 May 2016. ↑ Tassone 2002, p. 6. ↑ Tassone 2002, p. 7. ↑ Bachmann, Gideon; Antonioni, Michelangelo (Summer 1975). "Antonioni after China: Art versus Science". 28 (4). Berkley: University of California Press: 26–30. JSTOR 1211645. 1 2 3 Cook 2004, p. 535. ↑ Houston, Penelope (31 July 2007). "Obituary: Michelangelo Antonioni". The Guardian. Retrieved 9 May 2016. ↑ Bradshaw, Peter (27 September 2012). "Michelangelo Antonioni: Centenary of a Forgotten Giant". The Guardian. Retrieved 9 May 2016. ↑ Gazetas 2008, p. 246. ↑ Wakeman 1988, p. 65. ↑ Cameron & Wood 1971, p. 105. ↑ "Berlinale 1961: Prize Winners". Berlinale. Retrieved 23 January 2010. ↑ Tast, Brigitte; Tast, Hans-Jürgen (14 March 2014). "Light Room, Dark Room: Antonioni's Blow-Up und der Traumjob Fotograf". Kulleraugen (in German) (44). ISBN 978-3-88842-044-3. ↑ Echo and Leefeld 1977, pp. 8–12. ↑ Wenders 2000, p. 79. ↑ Johnston, Ian (August 1, 2006). "We're Not Happy and We Never Will Be". Bright Lights Film Journal. Retrieved 9 May 2016. ↑ Ebert, Roger (8 April 2005). "Eros". Chicago Sun-Times. Retrieved March 28, 2016. 1 2 Wexman 2006, p. 312. ↑ Antonioni, Michelangelo (October 1960). "Interview". Euro Screenwriters. Retrieved 9 May 2016. ↑ Samuels, Charles Thomas (29 July 1969). "Interview with Michelangelo Antonioni in Rome". Euro Screenwriters. Retrieved 9 May 2016. 1 2 Bordwell and Thompson 2002, pp. 427–428. ↑ Grant 2006, p. 47. ↑ Kurosawa, Akira: Something Like an Autobiography, p.242. Alfred A. Knopf, Inc., 1982. ↑ Ciment 2003, p. 34. ↑ Bogdanovich 1992, pp. 103–104. ↑ "From Acting to Directing, Cigars to Jazz, Actor Peter Weller Is a Man of Many Passions". Cigar Aficionado. 1 March 1996. Retrieved 9 May 2016. Arrowsmith, William (1995). Ted Perry, ed. Antonioni: The Poet of Images. New York: Oxford University Press. ISBN 978-0-19-509270-7.